William Quincy Belle: Was George W. Bush the worst president ever? Considering the fallout all Americans, in fact the entire world, continue to face from the various events which occurred during the Bush presidency like the war in Iraq, the financial crisis and the war on terror, this question has been discussed over and over again by pundits, political analysts and your average Joe in the street without having yet arrived at a satisfactory answer. Even during Mr. Bush's time in office, there were those who doubted his ability to lead and certainly doubted his decisions. On June 10, 2008, Congressman Dennis Kucinich and co-sponsor Robert Wexler introduced 35 articles of impeachment against Bush to the U.S. House of Representatives. On July 25, a vote of 251 to 166 saw the House refer the impeachment resolution to the Judiciary Committee where no further action was taken on it. 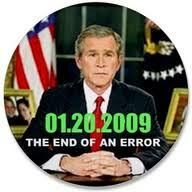 The second term of the Bush presidency ended on January 20, 2009 rendering impeachment efforts moot. Wow. Is that a condemnation or what? But let's not forget history. Eventually, somebody in the distant future is going to look back on the Bush era with a more objective eye. On July 30, 2003, George Bush gave a news conference on Iraq. During his talk he explained his reasons for the invasion talking about the supposed weapons program. "I'm confident history will prove the decision we made to be the right decision." This apparently was not the first time Mr. Bush suggested, in the face of criticism of his decision, that he would eventually be vindicated at some time in the future. In 1993, Bush was the owner of the Texas Rangers baseball team. At a September 1993 meeting of the Major League Baseball owners, Bush was the only baseball executive to vote against the plan to allow more teams into the playoffs each year. "I made my arguments and went down in flames. History will prove me right." The change was implemented and has been enormously popular with the fans and an unprecedented financial success for Major League Baseball. Mr. Fleming is an American military historian and historical novelist. On February 28, 2009, he penned the Wall Street Journal article "Was George W. Bush the Worst President?" to give his take on this question which was asked quite naturally when Bush's term in office came to an end on January 20, 2009. Apparently a number of historians had ranked Bush as the worst and Mr. Fleming found this to be perplexing. Fleming goes on to enumerate various presidents like John Adams, Thomas Jefferson, James Madison and Woodrow Wilson and their various actions which could be considered as catastrophic. When shooting started with revolutionary France in 1798, Adams offered to resign so that Washington could resume the job. Instead of building a navy to deal with the British, Jefferson declared an embargo on all trade with England and Europe and brought the American economy to a standstill. Wilson talked Congress into declaring war on Germany saying America would not have to send a single soldier. Before the end of the war, over two million troops were overseas. In modern times, Fleming cites Jimmy Carter as presiding over the most horrendous stagflation in U.S. history. In this light, however wavering, maybe it's time to suspend the rush to judgment on George W. Bush for 10 or 20 years. I suspect we will decide Mr. Bush's first term, with his decisive response to 9/11, deserves some praise, and that his second term succumbed to an awesome amount of bad luck, from his generals' disagreements on how to fight the war in Iraq to the Wall Street collapse of 2008. Many presidents have run out of luck in their second terms, but Mr. Bush's record in this department will be hard to match. Beyond the popularity polls there may be a dimension we should remember in judging every president: sympathy. Adams is a journalist for the Guardian in England and his July 1, 2010 article "George Bush: Worst. President. Ever?" has him concluding as did Fleming that we may be rushing to condemn Bush when history has other examples which may better qualify. Adams feels that Nixon with his resigning in disgrace, his foreign policy in Laos and Cambodia and his disastrous economic policies should be ranked worse than Bush. However he points out that William Henry Harrison may have a leg up on anybody else because he took office on 4 March 1841 and left it on 4 April 1841. I suppose one could argue that he didn't have time to do anything wrong but he certainly didn't have time to do anything right. Mr. Grayson was the U.S. Representative for Florida's 8th congressional district from 2009 until 2011. He is a member of the Democratic Party. This blog posting and the re-asking of the eternal question of where George Bush ranks among the worst presidents was prompted by a recent video clip of an interview with this gentleman on MSNBC. Amusingly enough, the interview at first gives the impression that Grayson supports Bush but you soon realize that no, Mr. Grayson is not in any way a Bush fan. Alan Grayson appears on MSNBC's The Ed Show to help give President George W. Bush the proper credit for his role in the killing of Osama bin Laden. Bush gets credit for torture, ruining America's reputation around the world, destroying the American economy, and getting us into two endless wars. The interview took place on May 5, 2011. The jury is still out. However leave it to politics to polarize opinions. Certainly looking back in time one sees things differently as one knows things one didn't know then. I remember a press conference held about three months before the war in Iraq started and Donald Rumsfeld said to the reporters that the war would not last longer than six months and cost no more than one billion dollars. The Second Gulf War or Operation Iraqi Freedom started on March 20, 2003. Estimates on the cost of the war are $1 trillion in direct costs and $1 trillion in complementary costs (interest paid on the funds borrowed to finance the wars, extra spending to care for veterans returning from combat through 2050). There are known "knowns." There are things we know that we know. There are known unknowns. That is to say there are things that we now know we don't know. But there are also unknown unknowns. There are things we do not know we don't know. The historian Thomas Fleming suggested that instead of rushing to judge Bush, we should look at him as with every president with "sympathy". I suppose that any of us have to remember that the president is a man just like any of us. And any of us could very well ask the question as to what we would have done in any of the circumstances the president faced and whether or not we would have made the "right" decision. Yes, we could ask ourselves that. However when I look back on 9/11, the war in Iraq, the war in Afghanistan, the war on terror, Katrina, the biggest financial crisis since the Great Depression, etc. I have to say to myself, "Wow!" During the presidency of George W. Bush, several American politicians sought to either investigate Bush for allegedly impeachable offenses, or to bring actual impeachment charges on the floor of the United States House of Representatives. The most significant of these efforts occurred on June 10, 2008, when Congressman Dennis Kucinich, along with co-sponsor Robert Wexler, introduced 35 articles of impeachment against Bush to the U.S. House of Representatives. The House voted 251 to 166 to refer the impeachment resolution to the Judiciary Committee on July 25, where no further action was taken on it. Bush's presidency ended on January 20, 2009 with the completion of his second term in office, rendering impeachment efforts moot. George W. Bush, the 43rd President of the United States, has elicited a variety of public perceptions regarding his policies, personality, and performance as a head of state. In the U.S. and elsewhere, journalists, polling organizations, and others have documented the expression of an evolving array of opinions of President Bush. Time magazine named George W. Bush as its Person of the Year for 2000 and 2004, citing him as the most influential person during these two years. According to Time, the distinction goes to the person who, for good or ill, has most affected the course of the year; it is therefore not necessarily an honor or a reward. The legality of the invasion and occupation of Iraq has been widely debated since the United States, United Kingdom, and a coalition of other countries launched the 2003 invasion of Iraq. The then United Nations Secretary-General Kofi Annan said in September 2004 that: "From our point of view and the UN Charter point of view, it [the war] was illegal." Alan Mark Grayson (born March 13, 1958) is the former U.S. Representative for Florida's 8th congressional district, serving from 2009 until 2011. He is a member of the Democratic Party. Thomas James Fleming (born 1927) is an American military historian and historical novelist. The Iraq War or War in Iraq, also referred to in the United States as the Second Gulf War or Operation Iraqi Freedom, began on March 20, 2003 with the invasion of Iraq by the United States under the administration of President George W. Bush and the United Kingdom under Prime Minister Tony Blair. The following is a partial accounting of financial costs of the 2003 Iraq War by the United States and the United Kingdom, the two largest non Iraqi participants of the multinational force in Iraq.